So I thought to do some research and this star, Sirius, which is often referred to as the ‘missing’ star; it also the brightest star in the sky. Known as the Dog star to Romans who associated the rising of the Dog Star at dawn with the hottest part of the year, called the “dog days”, and to the Egyptians it was the Nile star because its appearance before the Solstice would signal the flooding of the Nile, which of course, was headline news in those days. 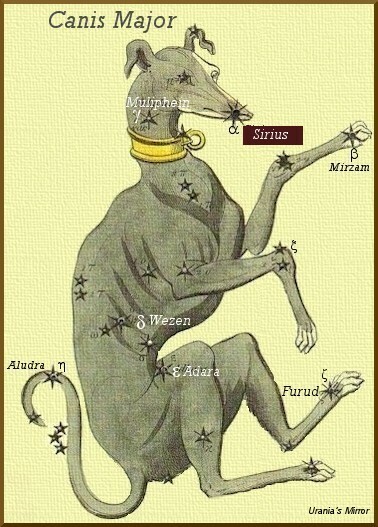 Nearly every culture has a story of Sirius, and all were guided by it in some way and attributed deeply spiritual properties to its movements. As I read more about this star, I came across something interesting and that is that the Sirius star is a binary star, which means, it is two stars orbiting in tandem with one another around a common mass. A German by the name Friedrich Bessel discovered the ‘missing companion’ of Sirius which later got nicknamed the ‘Pup’. So. Let’s review: We have longing, heat, two stars, and love. When someone says never to me it is as good as ensuring it will happen as the sun will rise tomorrow or Sirius will shine at dawn over the horizon. Sirius’s closest alignment to one another happened in 1994 and apparently the magnetic action produced from this occurrence has been related to everything from earthquakes and floods to a myriad of personal stories I’ve been reading that could be dismissed as simply crazy, but I have to say, my 1994 was an incredible, life-changing year. Sirius transits each year at its highest point in the north on February 20th. I am not one to put all my eggs in the astronomy basket, but I was born on February 15th. It makes me wonder if this gave me an extra dose of desire. Heat. Two stars. One orbit. Desire. Desire is not a bad thing; it won’t make you unhappy, as my mother would have you believe. Desire is the brightest star in your constellation, it begs you into its orbit, it pulls you towards it because it is your secret self that must be told. *This is an excerpt from a book of fiction I am working on in draft form. This is some background to the main character, Sam. * You can see other chapters on this blog. Her father was a tall thin man with fine soft skin and equally thin hair he absently ran his hand through ending this movement with a sort of swoop of his long fingers that signalled the end of a thought. He was an isolated man, full of regrets and sorrows he carefully managed like cutlery in a drawer. He was reticent to accept any kind of emotional expression and rejected assumption as a failure of research. Facts. He hung his hat on the concrete, the tangible and life precisely as it was and not what anyone reconfigured it to be in a metaphor. Euphemistic was an insult he used with glowering disdain. For Sam, growing up in this environment had twisted her ordered genes into roiling knots of subterranean desires, secrets and dramas she longed to chase down, like phosphorescence, glinting always there on the edge of the room, past the neatly arranged fixtures of their ordered home. Her father once looked at her across the table and quietly announced that she would ‘never marry because she was too fickle’. She had shifted uncomfortably on her chair not because she was sentenced to a life as a spinster but rather that she was fickle in her father’s eyes, a sin of a weak character surely. She stared down at her toes to avoid his eyes, noticing that the sun had tattooed a V pattern on the tops of her feet from her thongs. She knew there was something inherently wrong with her, confirmed by the quiet but firm way her father had set his coffee cup down, folded his newspaper with deliberate care and left the room. Despite his best efforts, however, her fickleness could not be beaten, could not be shamed, screamed or humiliated out of her. Her mother, in a last effort to dampen the escalating conflict, told her to stop wanting everything so badly; it would only hurt her to be so riddled with desire. But no matter how hard she tried to be invisible, to become absolutely content with their small house, small town, small dreams for her, she stubbornly shone, unable to be scheduled into the subtle dying of her mother’s spirit, the 9 pm medicine delivery her father divided into her hand in manageable swallows for a mother that never suffered from wanting, but rather, from never having known she hadn’t needed someone’s permission before asking for anything in life. 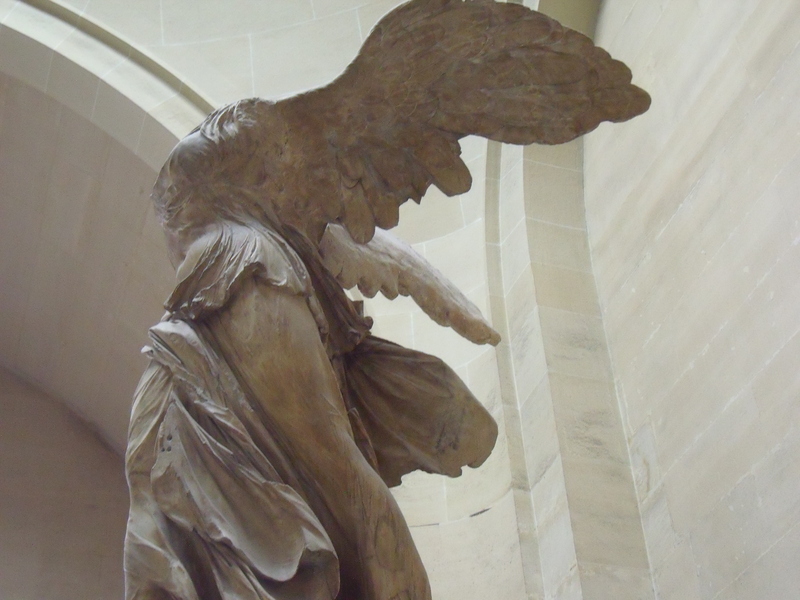 Her mother had died ‘a saint’, and she longed now for her softness, her ability to placate her father’s insistent realism, her small cluck at him from across the room that would re-align the tracks of their family, righting their path into instant goodness that neither her father nor she had been able to do since. She had burned with a kind of fever to escape from the stillness of the house after her mother had gone. She knew, more than other girls in her school, that fevers were for the dying and yet she had never felt so alive, lying there in her single bed, the phosphorescence of her imagination tugging her out from under the painful oppression of her father’s grief, towards open doors and kicked off shoes and music and words full of metaphors and she had known deep inside her, somewhere, there were people like her, feeling just this way, lying under a cool sheet in the middle of summer, burning up with an unfettered desire for their own life to begin.